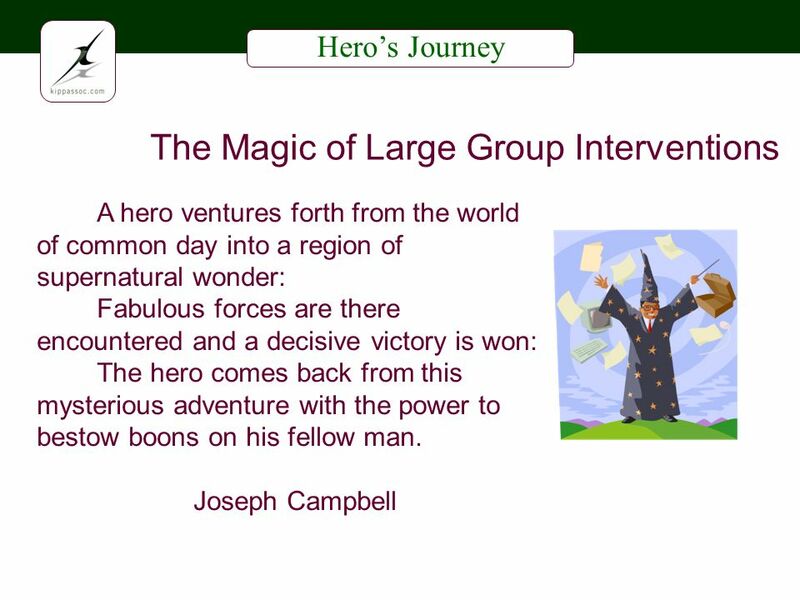 Heros Journey The Magic of Large Group Interventions A hero ventures forth from the world of common day into a region of supernatural wonder: Fabulous. 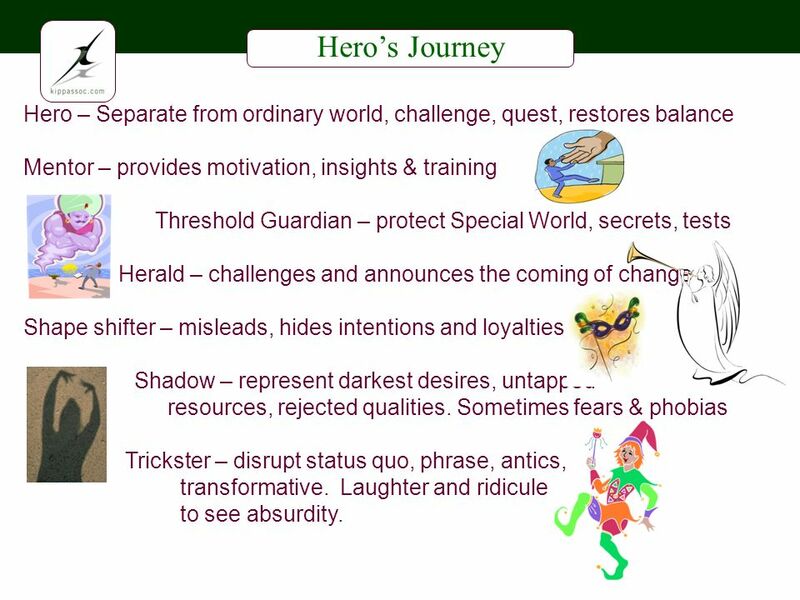 4 Heros Journey Hero – Separate from ordinary world, challenge, quest, restores balance Mentor – provides motivation, insights & training Threshold Guardian – protect Special World, secrets, tests Herald – challenges and announces the coming of change Shape shifter – misleads, hides intentions and loyalties Shadow – represent darkest desires, untapped resources, rejected qualities. Sometimes fears & phobias Trickster – disrupt status quo, phrase, antics, transformative. Laughter and ridicule to see absurdity. 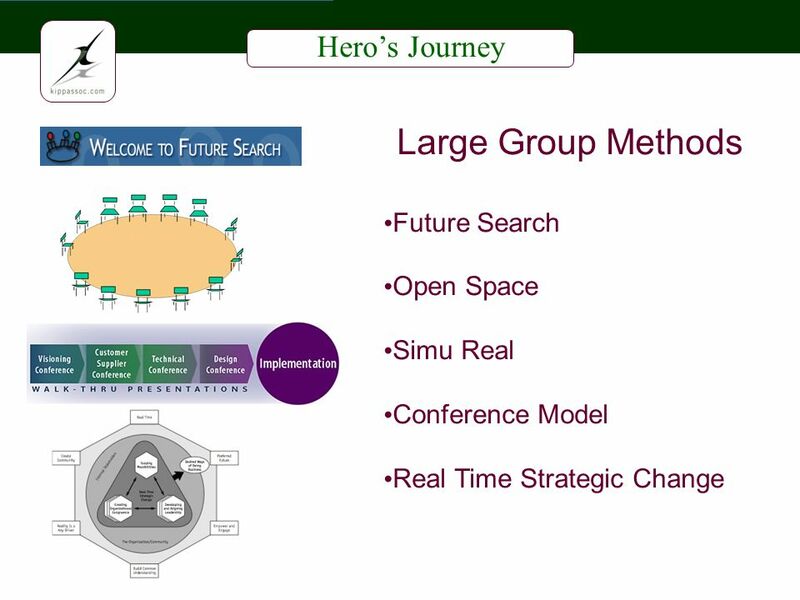 9 Heros Journey Mentor Each is a hero and an oracle to somebody, and to that person whatever he says has enhanced value. Mme. A.M. Bigot De Cornuel We all have mentors who have shown up in our lives. The length of their stay is inconsequential; it is the impact of that stay which will determine the title. 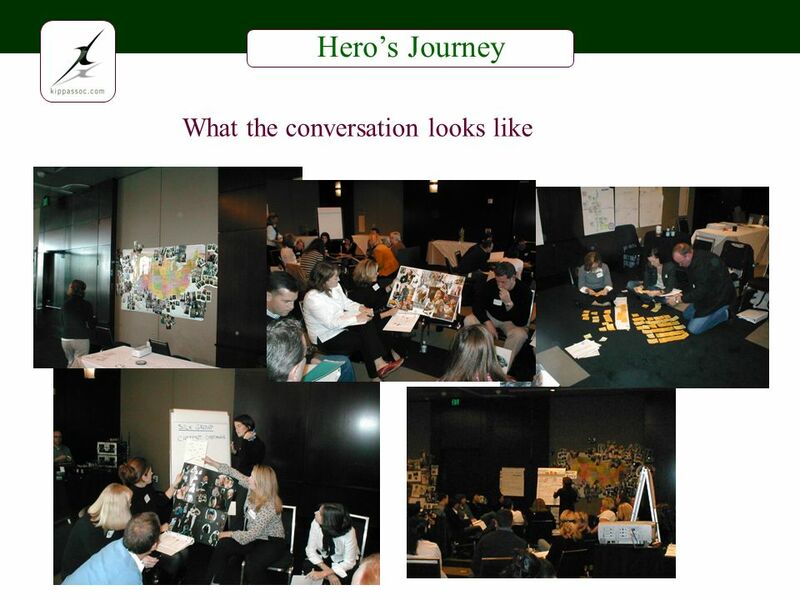 Download ppt "Heros Journey The Magic of Large Group Interventions A hero ventures forth from the world of common day into a region of supernatural wonder: Fabulous." Remember: Dont write down word for word – get main points down; if you need more time I will post this to the blog. 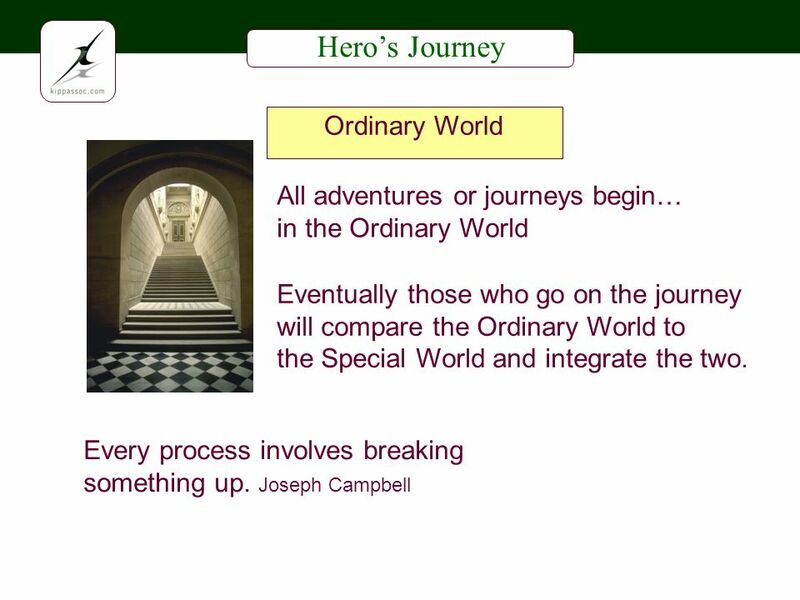 THE HERO’S JOURNEY CSCI 11, FALL THE HERO’S JOURNEY: DEFINED Described by Joseph Campbell in The Hero with a Thousand Faces Campbell called it the. 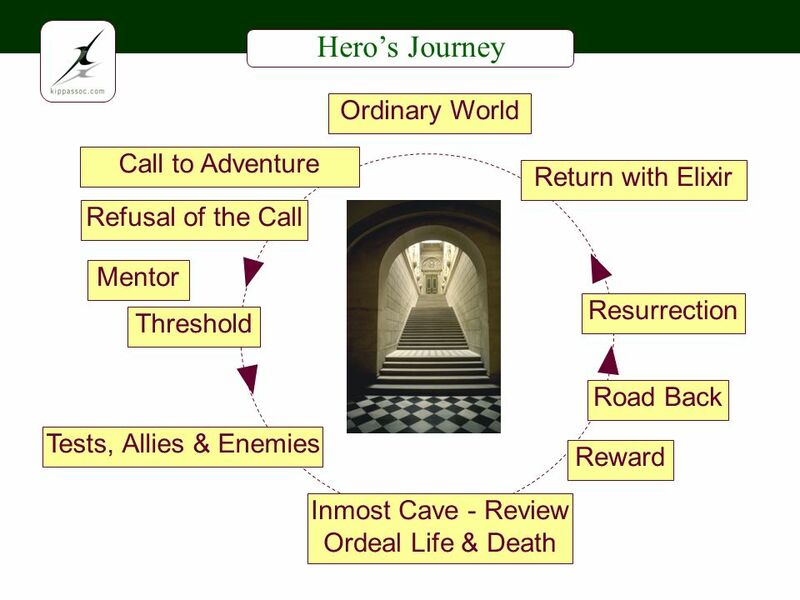 The Heroic Journey. 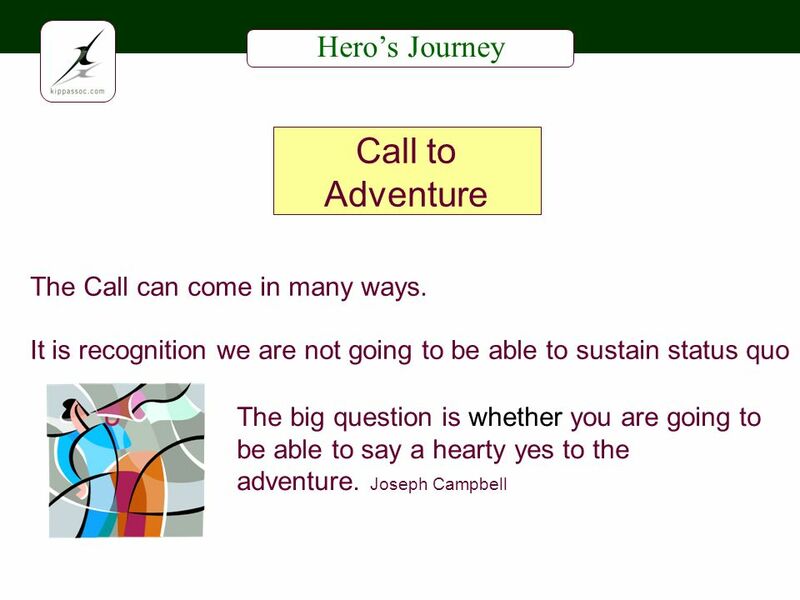 Joseph Campbell Campbell developed his idea of heroes and how they operate in cultures built on work he did as an anthropologist. 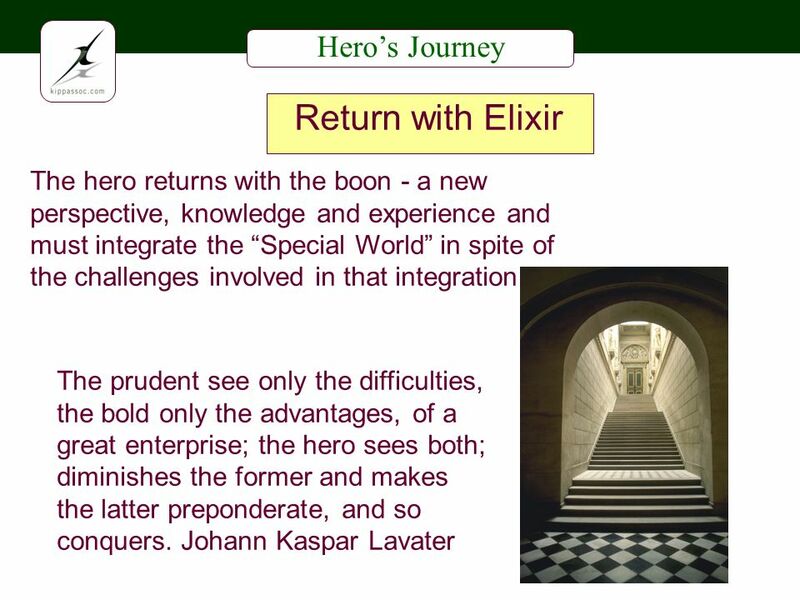 Physical Imaginative Inner Movement Transformation Adventure Development Challenge Change What Have We Covered? 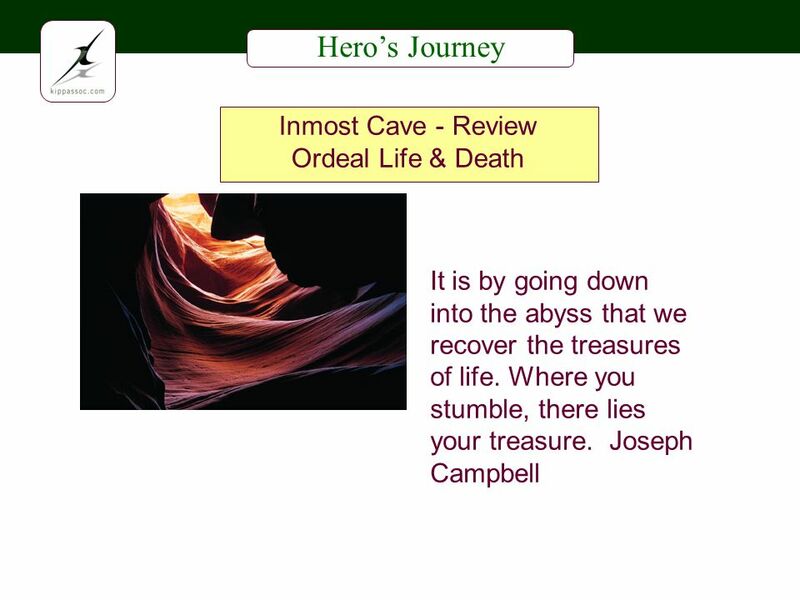  Joseph Campbell ( ) was a scholar who studied the Myths and Legends of different cultures.  Campbell found that even though many cultures were. 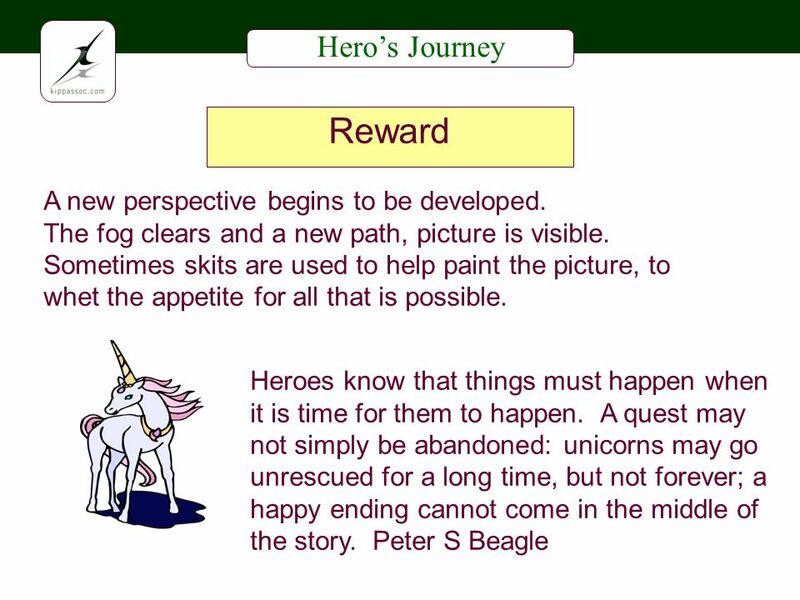 The Hero Journey Question: What is a hero?. 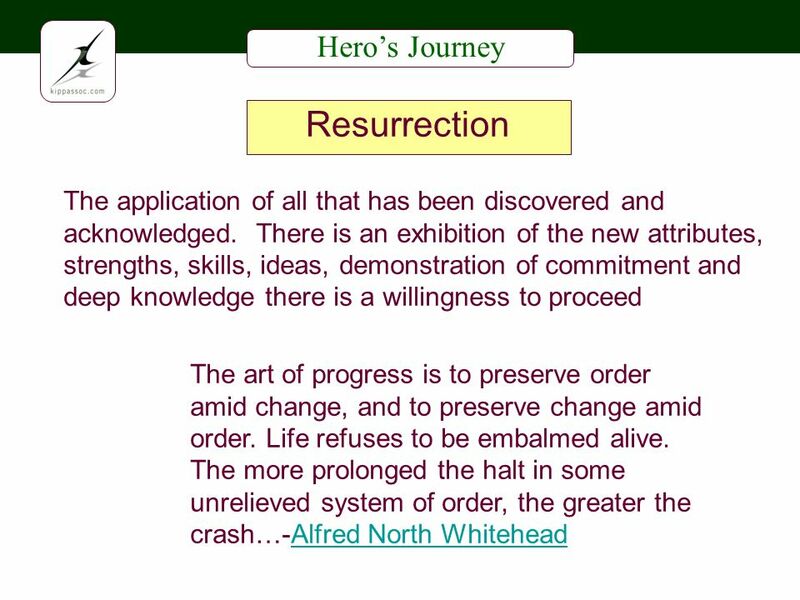 The Hero Journey is a paradigm. A paradigm is a model or standard form that governs our experience and sense. 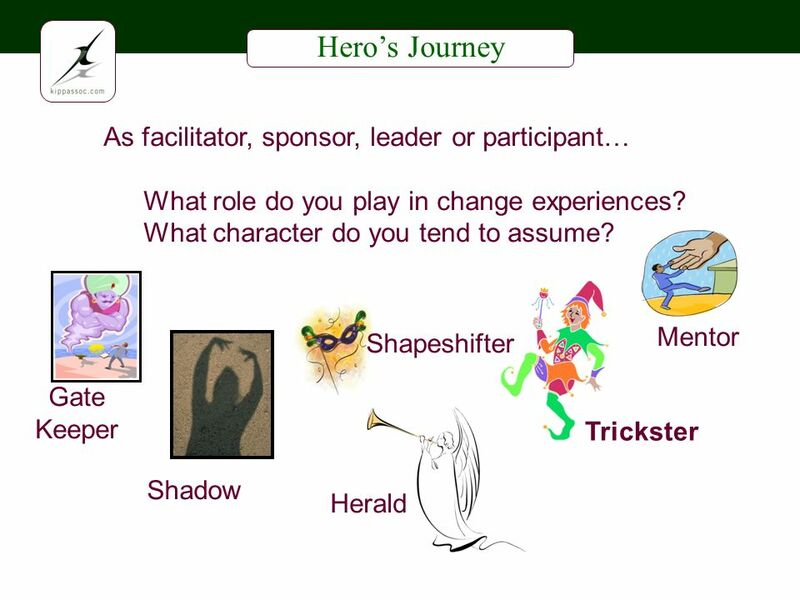 Archetypes and The Hero Week 36, Day 1. 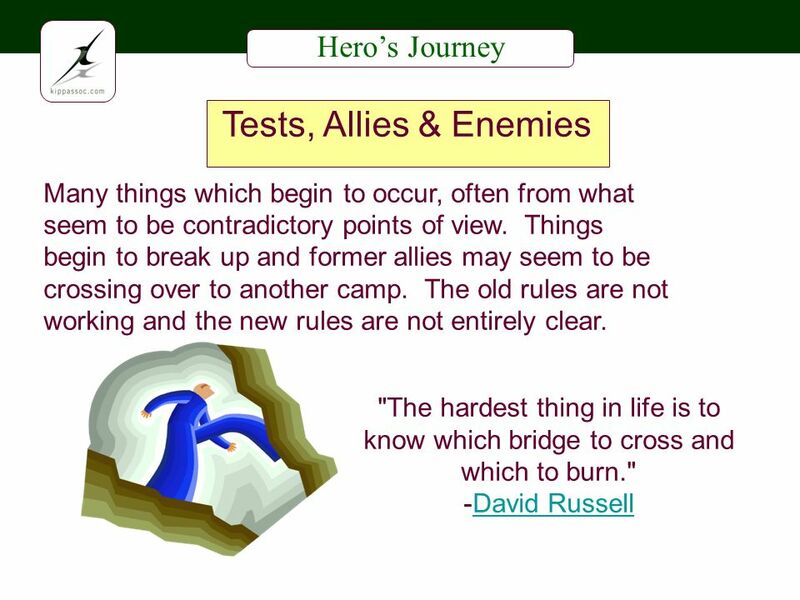 Daily Standards and Objectives Standards: RL : Analyze a particular point of view or cultural experience. 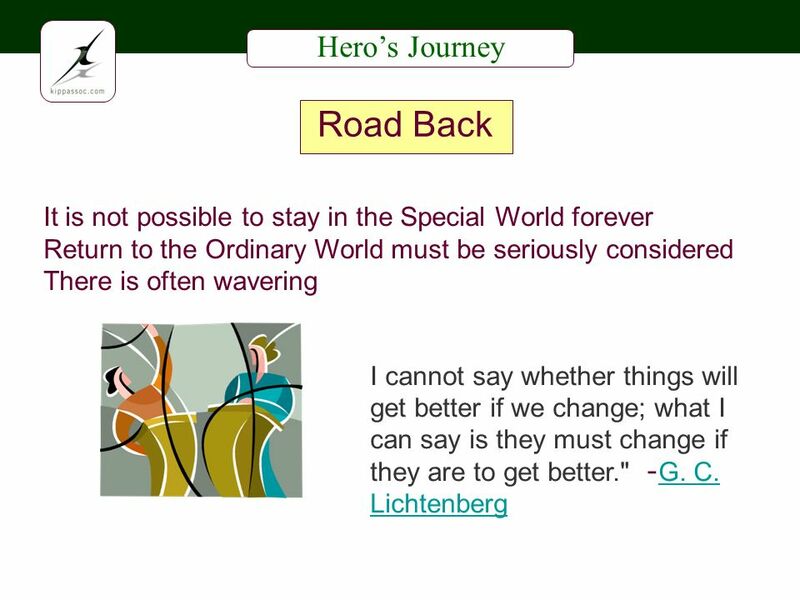  The Hero Journey is a paradigm.  A paradigm is a model or standard form that governs our experience and sense of reality. 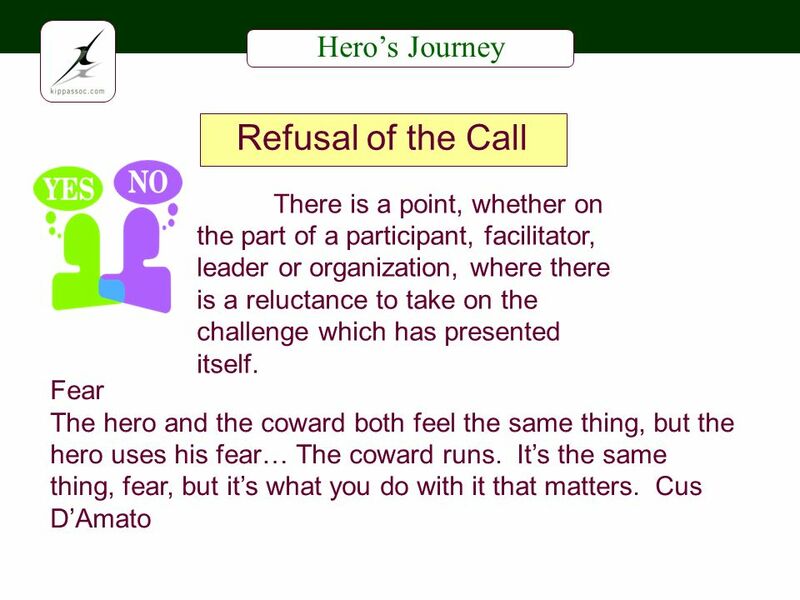 The Hero Journey is both.